Foto nova do escritório da Merlintec e do novo servidor onde esta página está hospedada. 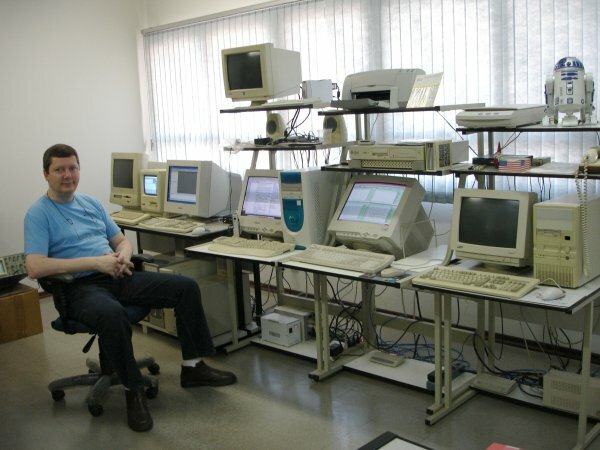 New picture of the Merlintec office and the new server which hosts this page. Apresentação (usando Prezi, que precisa de Flash) da defesa de mestrado do Jecel. O texto da dissertação (arquivo .pdf de 8,5MB) pode ser encontrado na biblioteca virtual da USP. Presentation (using Prezi, which requires Flash) of Jecel's defense of his master's project. The dissertation is available (as an 8.5MB .pdf file in Portuguese) in the virtual library of the University of São Paulo. Palestra sobre o SiliconSqueak no SqueakFest Brasil 2009 em Porto Alegre. Talk about SiliconSqueak at SqueakFest Brazil 2009 at Porto Alegre, Brazil. Slides of the talk as a PDF file. Palestra sobre o SiliconSqueak no 10º Fórum Internacional de Software Livre em Porto Alegre. Talk about SiliconSqueak at the 10th International Free Software Forum at Porto Alegre, Brazil. Slides of the talk as a PDF file. Palestra sobre hardware para Smalltalk na sessão "Birds of a Feather" sobre Squeak na OOPSLA em Nashville. Talk about Smalltalk hardware at the "Birds of a Feather" session about Squeak at OOPSLA in Nashville. Slides of the talk as a PDF file. Em colaboração com o grupo Morphle da Holanda e o Hawthorne Center for Innocation dos Estados Unidos, a Merlintec está atualmente focada no SiliconSqueak. In collaboration with the Morphle group (Netherlands) and the Hawthorne Center for Innovation (USA), Merlintec is currently focused on SiliconSqueak. Outra atualização do diagrama de blocos do Merlin 6 e uma nova foto do escritório da Merlintec. A new update to the Merlin 6 block diagram and a new photo of the Merlintec office. O diagrama de blocos do Merlin 6 foi atualizado. The Merlin 6 block diagram has been updated. As fotos e desenhos do projeto foram organizadas num album para dar uma visão histórica de sua evolução. The pictures and drawings related to the project have been organized into an album to give a historical overview of its evolution. O antigo site do projeto foi espelhado aqui. A arquitetura do processador do Oliver foi atualizada. A descriçao da arquitetura do Plurion (arquivo PDF) foi atualizada. The old project site has been mirrored here. The architecture for Oliver's processor has been updated. The description of the Plurion architecture (PDF file) has been updated. De 15 a 18 de Outubro a Merlintec estará expondo protótipos no estande 9 da XVIII Fealtec em São Carlos. Dia 28 de Outubro (12 horas) e 29 (16 horas) os protótipos serão demonstrados na sala 205B da OOPSLA 2003 em Anaheim. From October 15 to 18 Merlintec will be showing prototypes at booth 9 of Fealtec XVIII in São Carlos. On October 28 (noon) and 29 (4pm) the prototypes will be demonstrated in room 205B of OOPSLA 2003 in Anaheim. Another page was created to keep track of Oliver's development (in Portuguese). A new web site (http://www.smalltalk.org.br), a swiki and a mailing list at YahooGroups are the resources created for a brazilian Smalltalk user's group. All content is in Portuguese. A new pages describes (in Portuguese) the tests done on the first prototype for Oliver, the terminal for truck drivers. 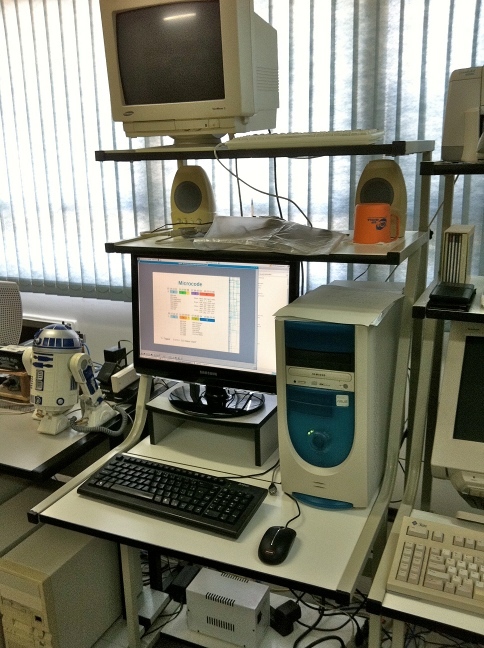 The tests were finished on June 23. Merlintec will be present at Fealtec XVII in booth 34 (from October 16 to 20 in São Carlos' SESC). The pamphlet (Portuguese only - sorry) created for this event is available for download. 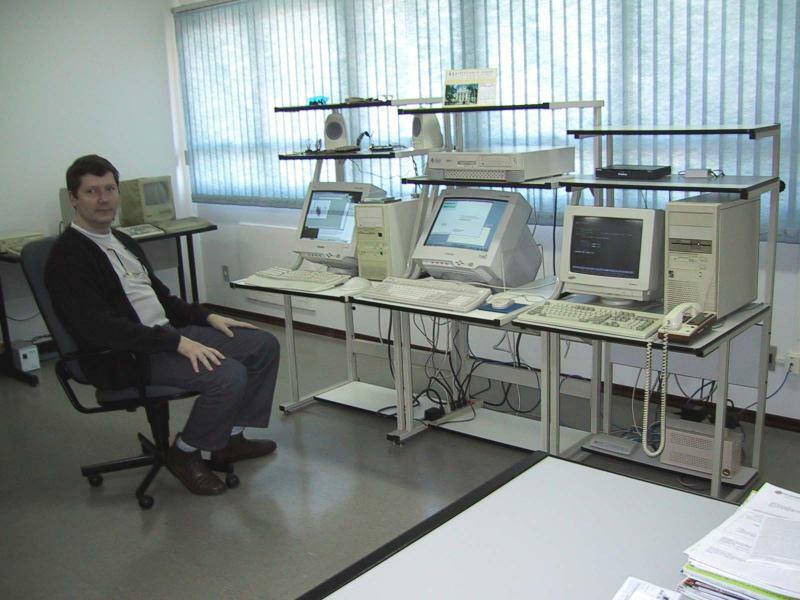 White paper in Portuguese: "Merlintec: Computer Technology for 21st Century Brazil"
A Merlintec se orgulhou de participar da feira de alta tecnologia da cidade de São Carlos. Veja uma foto de nosso estande. Estamos apresentando modelos físicos do computador Merlin 6. Merlintec was proud to be a part of the "high technology fair" in the city of São Carlos. See a picture of our booth there. We are showing physical models of our Merlin 6 computer. 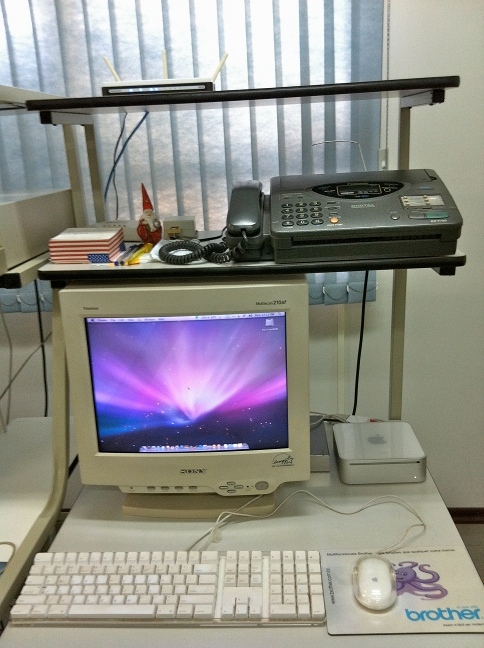 See a photo of our current office. See details of projects being developed at our new Swiki server. Primeiro evento sobre a linguagem Self no mundo. First conference about the Self programming language in the world. 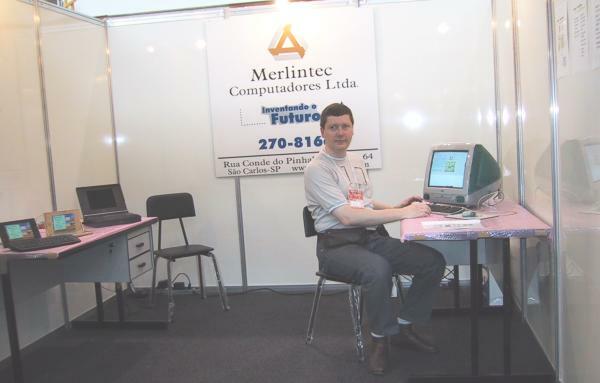 The name of the company was changed to "Merlintec Computadores Ltda."